Please read this email exchange with Shamnad Basheer starting from the earliest to the latest email in chronological order. I will be reproducing this correspondence and his Facebook post (screenshot attached) as an example of whistle-blower targeting and retaliation in the writ petition which I will file against General Electric Company in the Supreme Court of India. You finally end up exposing yourself and your true agenda. And you are supposed to be a responsible academic. I will be reproducing this correspondence and your FB post as an example of targeting in my writ petition which I will file against General Electric Company in the Supreme Court of India. I think I'll concentrate my energies on fighting my corruption battle against General Electric in the Supreme Court of India rather than responding to the rest of your vitriol against me. 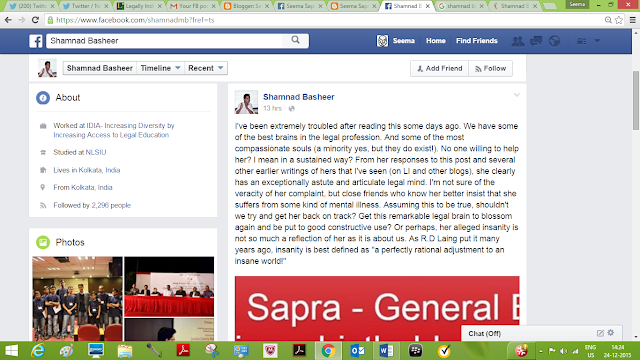 "To be clear, Seema Sapra is a pitiable creature in a very difficult situation. However, that does not detract from the fact that she is a public nuisance and that, due to a variety of peculiarities in her circumstances, the law offers only very limited protection from her. The point of this website is not to mock Seema, but rather to help those that encounter her protect themselves, whether they just want to avoid her or actually want to intervene and help her. Seema is a lawyer who until a few years ago appeared to have a successful professional career, but currently seems to be suffering from mental illness. She is at present unemployed, has broken off all contact with her family (which has disowned her and refuses to take responsibility for her) and lives out of her car, which she parks in different New Delhi neighbourhoods, frequently quarrelling with residents when they complain about her “living” there. On one occasion, she started screaming at a woman whose house she had parked outside that the woman had been sent to murder her. On another occasion, she broke down the front door of a senior police officer who was not taking her call." And lawyers in the Delhi high court openly discuss this. So what is so surprising about this allegation? And why should my mention of it on a FB post as only a possibility (I was careful in my wording) harm you anymore than the theories already floating around about you. As the tenor of my Facebook post will demonstrate, I meant well for you--and wanted to find out if there are ways in which some of us could help. I really think you have a terrific legal mind. If you insist that you are sane and others are doing this at the behest of GE (since your claim appears to be that almost everyone who raises issues about your sanity is necessarily an agent of GE), why don't you just volunteer to a neutral psychiatric evaluation? And if it makes you happy, some of us who wish to help you can also subject ourselves to such evaluation too so that you are not alone. And we can chose someone independent who is not an agent of GE and who will not dare poison or gas you! If I were you, I'd just do that and put an end to this speculation. Rather than being so hostile and adversarial to me and others that are trying to help you. I really dont want to engage with you anymore! I'm so sorry I even tried. As I understand, the reason why nobody wishes to help you is because you attack the very same people that try and do so. I've really spent way too much time on this and have only received hostility from your end. I don't wish to engage with you anymore. This will be my last communication with you. Please feel free to call me an agent of GE and publish all of this (you seem to be publishing your responses to me on your website even before you've actually emailed me and tagging me on twitter incessantly) and/or take me to court and initiate proceedings etc. I only wish you the very best and may god bless you. Shamnad, who are these close friends of yours who know me better. And how do they know this about me. So much that they insist upon this? Please name them. Maybe I can expose the basis/ motive for their obviously targeting me. Maybe I can also ask them to stop spreading such rumors about me. Please post this entire exchange on your FB wall. So you are saying that you chose to speculate on FB that I am mentally ill merely on the basis of conversation with some of your close friends who practice in the Delhi High Court. Does the evidence that I have produced against GE and the evidence showing that I am being targeted, do my comments on the LI story, does my corruption case against GE not show that I am a whistle-blower. How can you justify such extremely harmful speculation in an extremely sensitive mater merely on the basis of loose and cheap talk? Seema. You misunderstood the part about "close friends". These are my friends I refer to..not yours. Friends of mine who work in the delhi high court and know you. Please therefore amend your response in the light of above clarification and send. I will then post. Thanks. The facts are that I filed a corruption case against General Electric Company which was wrongly dismissed by a Division Bench of the Delhi High Court in February 2015. In that case I produced evidence of wrongdoing by General Electric and evidence of physical harm (including poisoning) caused to me and attempted to be caused to me along with evidence of the most vicious retaliation against me. The Delhi High Court Bench did not look at this evidence and instead dismissed the petition by in my view a clearly legally unsustainable judgment. Now the same Bench has passed an order sentencing me to prison for one month in a contempt case connected to the hearing of my corruption case against General Electric Company. I have stated that any prison sentence will be used to further drug, poison and eliminate me. And that I will not only appeal against the Contempt ruling but will also file an Article 32 petition seeking redressal of my whistleblower corruption complaints against General Electric which continue to give rise to a threat to my life and my complaints that I have been targeted, and have even been poisoned. Unfortunately the story also mentioned and linked to an anonymous blog targeting me since March 2014 which is being used to disseminate lies against me and to falsely describe me as mentally ill.
Now in the comments posted on the Legally India story, another person and I objected to Kian linking to the anonymous blog. In my comments I exposed that the anonymous blog was full of lies. I also provided links to documents and analysis to support my position that my corruption case against GE was wrongly dismissed.I linked to an application from the court record in my corruption matter seeking prosecution of General Electric executives for making a false police complaint against me with the atrocious claim that I was researching explosives on the internet. What such a false complaint against me was intended to achieve is self-evident. Anonymous trolls also targeted me in the comments at LI in an attempt to silence me, but some persons supported me. Unfortunately Kian Ganz shut down the comments on that story otherwise I would have continued to expose General Electric corruption and their retaliation against me. "I've been extremely troubled after reading this some days ago. We have some of the best brains in the legal profession. And some of the most compassionate souls (a minority yes, but they do exist!). No one willing to help her? I mean in a sustained way? From her responses to this post and several other earlier writings of hers that I've seen (on LI and other blogs), she clearly has an exceptionally astute and articulate legal mind. "I'm not sure of the veracity of her complaint, but close friends who know her better insist that she suffers from some kind of mental illness. Assuming this to be true, shouldn't we try and get her back on track? Get this remarkable legal brain to blossom again and be put to good constructive use? Or perhaps, her alleged insanity is not so much a reflection of her as it is about us. As R.D Laing put it many years ago, insanity is best defined as "a perfectly rational adjustment to an insane world!" I have objected to your making a statement that "close friends who know her better insist that she suffers from some kind of mental illness". You do not name these alleged close friends or disclose the source of your information. I have pointed out to you that I have no close or other friends. I am not mentally ill. And that false rumors are being spread about me. Please tell me who are these alleged close friends? Have you spoken to them directly? Or is your information from a third party?What is the source of your information for this statement. It was indefensible of someone in your position to call a lawyer mentally ill on Facebook without any material or basis therefor and that too a person fighting a corruption battle. As I have stated this was defamatory, it causes me harm and these kind of rumors which your post helped spread further aggravate the threat to my life. "I'm not sure of the veracity of her complaint, but close friends who know her better insist that she suffers from some kind of mental illness. Assuming this to be true, shouldn't we try and get her back on track? Get this remarkable legal brain to blossom again and be put to good constructive use? Or perhaps, her alleged insanity is not so much a reflection of her as it is about us. As R.D Laing put it many years ago, insanity is best defined as "a perfectly rational adjustment to an insane world!" The rest of your statement above also affirms the mental illness falsehood as it starts with you saying "Assuming this to be true,"
The spreading of malicious and false rumors that I am mentally ill further endangers my life. I have had to personally message over 35 people who liked your post in order to set the record straight. This is a very serious issue given the kind of unfounded speculation you posted and encouraged about me. It only aggravates the threat to my life. Please undo the damage you have caused to me by publishing this email on your Facebook wall. Shamnad, Can you please publish only the above on your FB wall. Also Seema: please note that since your main grouse is against the below quoted statements, please restrict your response (to be posted on my FB Page) only to that. Thanks and I wish you the very best. ""I'm not sure of the veracity of her complaint, but close friends who know her better insist that she suffers from some kind of mental illness. Assuming this to be true, shouldn't we try and get her back on track? Get this remarkable legal brain to blossom again and be put to good constructive use? Or perhaps, her alleged insanity is not so much a reflection of her as it is about us. As R.D Laing put it many years ago, insanity is best defined as "a perfectly rational adjustment to an insane world!" Sure. Send me a response. I will post. Merely deleting the defamatory post about me will not suffice. You have 2299 people following you. Many of them must have read your post and they were all misled about me. They will further discuss me with others and further spread defamatory and vicious rumors about me. I am in such difficult circumstances and your post misled people about me. Your post has harmed me. You must issue a public apology on your Facebook wall and allow me to comment there. Since your quota of 5000 follows is not exhausted, please accept my follow request so that I can post a response. Or post a response from me - I will send it to you. This is a very serious issue given the kind of unfounded speculation you posted and encouraged about me. It only aggravates the threat to my life. Please undo the damage you have caused to me. You know who I am as we corresponded in 2009. Those emails are reproduced below. Thanks. Please edit your post. The spreading of malicious rumors that I am mentally ill further endangers my life. I have had to personally message over 35 people who liked your post in order to set the record straight. Please post my response on your FB page yourself. I can draft a short response for you to post. This is only fair. Sorry. Unfortunately I cannot add more friends since my quota of 5000 is exhausted. I will edit my post to remove that reference. Your Facebook post is facilitating the spread of the malicious rumor that I am mentally ill. Please give me the opportunity to comment there to set the record straight. I am sending you a FB friend request. Please accept it. Since so much has happened over the last 5 years, I sometimes mix up dates if I am not careful. The email to you was drafted in a hurry so I mixed up some facts. Hence this email to set the facts straight. I fractured my fibula in June 2014 and checked into a hotel (Red Fox at Aerocity) with a plaster cast that night because I had no where else to go. I was in a wheelchair and stayed at that hotel for 3 nights using a wheelchair to move around the disabled friendly room and to use the toilet. My ankle was fine. I left that hotel and used a taxi to go straight to Fortis Hospital in Vasant Kunj where a doctor deliberately dislocated my ankle while removing the plaster cast and then tried to force me into surgery. I was not even told that my ankle had been dislocated. I drove off in my car. I first got a new sim card so that I could use my phone. I slept that night in my car outside gate 8 of the Delhi High Court. I slept sitting up in the drivers seat with my fractured leg stretched out across the hand brake area towards the passenger side where I rested the leg on some bags. The next morning I drove around trying to decide what to do and where to go. I drove to the YWCA on Parliament Street and checked in there. I was unable to walk, I was confined to the room for the duration of my stay here. I used a walker in my room to hop to the toilet. I was targeted there as well. Toxic chemicals were again released into my room. I was again most likely drugged. I was dependent upon food being delivered to my room. I made police complaints which were again ignored. All of these facts and complaints were on the court record in WP Civil 1280/ 2012 in my whistle-blower case against General Electric Company. Shamnad, please allow me to respond to your post about me publicly. First I thank you for drawing attention to my situation and for your sympathy. I am fighting a corruption whistle-blower battle against General Electric. The false rumors being spread about my being mentally ill are meant to target me. Which close friends are you talking about. Those who outright refused to help me find a place to stay when I was in court against GE, those who did not care if I had warm clothes, that I was forced to sleep in my car on Diwali, or in the dead of winter? Or that I had money for food. Or that I was being physically harmed. I request you to please not give voice to those spreading false stories about me, Let me comment in person on yr FB wall. Do you know what J. Rajiv Shakdher said when my application for shelter came before him in July 2012. He had adjourned the application to Oct 2012 without relief. When I asked him please tell me where will I stay till then, his reply was "I have no clue". I was forced to sleep in my car for over a year in the height of summer and the dead of winter. When I fractured my leg and called lawyers from the hospital asking if they could help arrange for a place for me to stay, they all refused. I checked into a hotel. Three days later I was forced to leave that hotel because I was targeted there. That night I slept in my car with a three day old fractured fibula and a less than a day old dislocated ankle. All I had was an Aircast boot on. I then checked into another hotel. All of this was on the court record. All judges knew what I was going through. So did the Bar Associations & Bar Councils. None of them even responded to my written requests for support. These written requests for support with receipt stamps are part of the court record in WP Civil 1280/ 2012. I requested several lawyers to help me rent a flat. No one helped. And now these anonymous so-called friends are commenting online and defaming me by calling me mentally ill? Good to hear from you. Do read the article and let me know what you think. And congratulations on your appointment at NUJS. Regarding this post, I would have liked to get involved in a substantive discussion but I have a slight professional conflict of interest situation here so i'll pass the opportunity to comment. But very generally there is no exhaustion of remedies kind of provision in WTO dispute settlement law. In fact, the DSU claims exclusive jurisdiction for the WTO DSB in adjudicating any violation of WTO law. A challenge in EC domestic courts would raise the issues that have arisen in the "direct effect" series of caselaw. 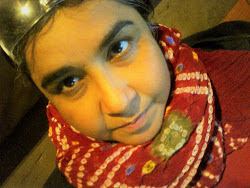 I am based in delhi and working independently.
" TRIPS: An "Exhaustion of Remedies" Doctrine? suggesting that actions taken by Dutch customs authorities were "legal"
itself is far from clear." What do you think? Look forward to your views. Seema is a lawyer who until a few years ago appeared to have a successful professional career, but currently seems to be suffering from mental illness. She is at present unemployed, has broken off all contact with her family (which has disowned her and refuses to take responsibility for her) and lives out of her car, which she parks in different New Delhi neighbourhoods, frequently quarrelling with residents when they complain about her "living" there. On one occasion, she started screaming at a woman whose house she had parked outside that the woman had been sent to murder her. On another occasion, she broke down the front door of a senior police officer who was not taking her call."